The marketing research handbook titled “Decoding Lucknow: Special Issue on Food” published by CMEE during the year 2014 provides a wealth of detail on food and drinks consumption in Lucknow. The core of the book comprises of Information gathered at annual market research fair organised by IIML students. There is a rich variety of information here that should be of interest to food and beverage industry, local shops, health authorities, and consumers themselves. Consumption habits of people of Lucknow (Lucknowites) was the core area of investigation for this book. To facilitate the research as well as reporting process, the whole story was organized into three parts: 1. Eating at Home 2. Eating out of Home 3. Beverage Consumption. Interesting insights from each of the exploration areas is presented below. EATING AT HOME: Breakfast habits of Lucknowites presents an interesting picture. On weekdays, more than 70% of the students have their breakfast before 8 am and leave for school/college. The older students (graduates / post graduates) have it progressively later – graduates between 8-9 am, and post graduates between 9-10 am. Almost all the other segments tend to have their breakfast by 10 am. 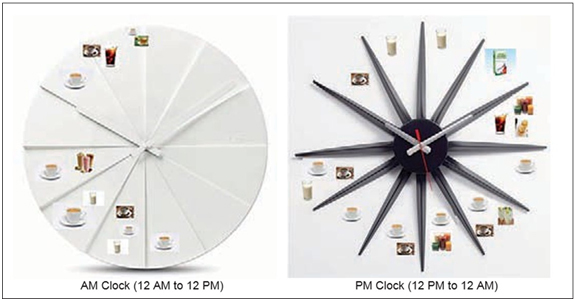 So it is interesting that on weekdays the breakfast time is largely dependent on school/college or office timings. Weekends seem to have a more relaxed pace as there are fewer constraints on time. Across all age and occupation groups only about 20% have their breakfast by 8:00 am. Another interesting facet of breakfast consumption lies in the frequency of consumption. Across segments majority of the respondents consume breakfast every day. This percentage is the highest for females at 94%. 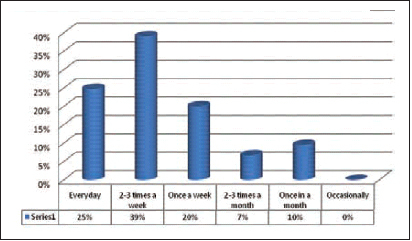 The following figures represent interesting findings about breakfast consumed during weekdays and weekends: As far as Lunch is concerned, majority of people (39%) have their lunch between 1-2 pm. The time slots of before 1 pm and 2-3 pm see the next major chunk of people consuming lunch. Only 9% have their lunch after 3 pm. Segment wise, there were some interesting findings. About 50% of working people have their lunch break between 1-2 pm. Majority of people belonging to SEC C/D/E have their lunch before 1 pm. This deviance from the trend of the majority having lunch between 1-2 pm can be attributed to their lifestyle and work. Home is where the heart is. Nowhere in the world is home food given so much importance as in India. So it is with the people of Lucknow. Almost 82% of respondents said that they have lunch at home every day. Interestingly, just 2% of the respondents have lunch cooked out of home every day. The next logical step lies in exploring the items which residents of Lucknow like to have for lunch – during weekdays, weekends and special occasions. Chapati, rice, daal and sabzi form the biggest items for lunch in Lucknow as shown in the tables above. Interestingly, some people also like to have a light lunch in the form of sandwiches or samosas instead of going for the conventional lunch. The following figure depicts the items taken in Lunch during weekdays and weekends: As the final meal of the day, dinner at home is one of those few occasions during the day when the whole family can be together. Most of the Lucknowites eat their dinner at home after 10 pm. This may be attributed to the change in lifestyle wherein people prefer to eat filling items/snacks during the day which eventually pushes back the time for dinner. As expected, graduates form the largest section of the population eating out. In fact, they dine outside home as often as 2-3 times or more in a week. On the other hand, the number falls drastically when it comes to women. It is only on weekends that they go out to malls and movies with family, and have food outside. Lucknowites mostly eat paratha with sabzi and achar for dinner. Rice-daal and kari have also become a preferred choice for many people. Salad is consumed by a majority of people which reflects the growing health consciousness among the people of Lucknow. Often, fruits also make it to the dinner table. 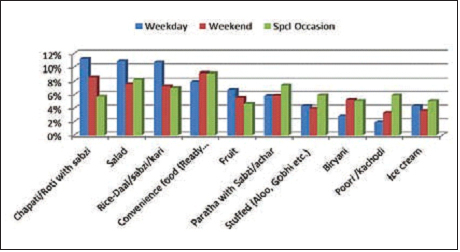 The following figure presents the weekend and weekday dinner items for people of Lucknow: EATING OUT OF HOME: As can be seen from the frequency of eating out, it pretty much shows the ‘foodie’ nature of the Lucknowites. 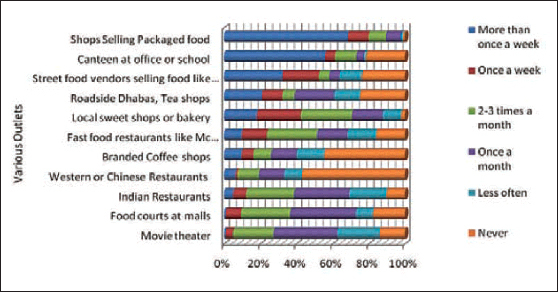 Around 1/4th of the overall respondents eat out every day and around 2/5th eat out 2-3 times a week. Young Lucknowites between the ages of 16 to 28 years are the people who eat out more frequently than any of the others. Unexpectedly, the eating out average of the SEC-A is slightly less than the overall average of eating out. In general, eating out is pretty stable across all other demographics. Lucknow has more or less preserved the tradition of eating at home except for the youth, especially in SEC-A/B, who have started to eat out more often than their parents. If packaged snack food eating is included in the definition of eating out, then the propensity to eat out seems higher, with 25% eating out every day. Lucknowites sure like to snack out more than go for full meals out of home. For some of the unmarried men staying in Lucknow to study or to work, eating out is a need as they seldom find the time to cook themselves. Also, certain homes in Lucknow do not cook non-veg at home while the city overflows with delicious non-veg cuisine like Tunday kebabs, galoti kebabs, rolls, etc. So the only way to savour these delicacies is to eat out of home. Street food, Awadhi cuisine is still the choice of Lucknowites – fast food giants like McDonalds and KFC and branded coffee shops are visited more by the youth, where good options of Indian food are still available at affordable prices. 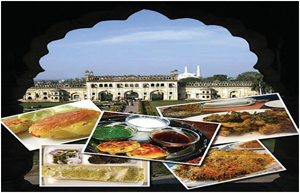 Western or international cuisine are taste changers for the youth but not yet the masses in this heritage city of Lucknow. Figure below presents the frequency of eating out at various types of outlets in Lucknow: Interestingly, 25% people have never visited roadside dhabas, 45% people have never visited a branded coffee shop, and 57% have never visited a Western or Chinese restaurant. Western or Chinese restaurants are the least preferred options for eating out, which shows that the modern fine dining speciality food culture has not penetrated much among the Lucknow people. Lucknow has evolved a lot in terms of eating out. Change in consumption habits from the past are less often driven by roadside dhabas and street food vendors, which is no surprise. Most often this change is caused by fast food restaurants, movie theatres, shops selling packaged food, and branded coffee shops as with time new fast food chains are entering Indian cities and people are drawn towards them because of their established popularity. Also, these people want to try something new every time they eat out. There is no change in the consumption habits mostly of people who visit Indian restaurants and local sweet shops or bakeries. These are the type of outlets which have established loyalty with their customers over a period of time. In terms of changes in consumption at outlets outside, figure below represents the clear picture. Casual hang-out with friends is a norm now a days for SEC-A. It is also a tradition on special occasions like for birthday treats. Those staying at hostels, be it from any SEC, have to eat outside. Only the spending amount differs across different SECs. Girls are also more conscious of the place, location, and gentry while eating out. SEC-C girls mostly go out with their families. SEC-C students either eat out on rare occasions or under necessity. 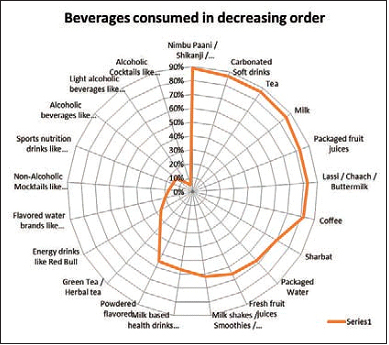 BEVERAGES: We made an effort to gauge the awareness of and consumption pattern of respondents for current and new product categories in the beverages segment. New segments like packaged milk products (chaas, lassi), energy drinks (Gatorade, Red Bull), canned fruit juices, ready-to-eat soups, flavored milk etc. were also explored. 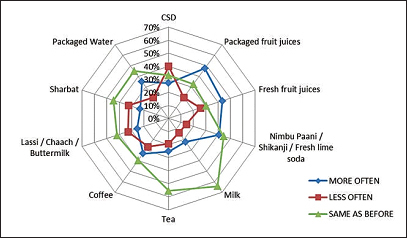 The following figure highlights the beverages consumed by respondents in the last 3 months (relative to the exercise) in a decreasing order: The overall beverage consumption of Lucknowites depicts an interesting trend, showing more takers for drinks like nimbu paani, shikanji, and fresh lime soda followed by milk, tea, coffee and CSDs. Hygiene seems to be a major concern for Lucknowites with 83% preferring packaged fruit juices over fresh fruit juices (66%). Also, 34% of Lucknowites prefer green/herbal tea, again a sign of health consciousness. Energy drinks like Red Bull have good presence in terms of consumption. Females in Lucknow prefer drinks like nimbu paani / shikanji / fresh lime soda, tea, and milk which are the traditional drinks. Males prefer carbonated soft drinks, packaged fruit juices, etc. Our study also suggests that carbonated soft drinks, packaged fruit juices & packaged water are highly consumed by males as compared to females. Sharbat and tea are almost equally preferred by both males and females of Lucknow. Social status is also a key factor determining beverage consumption. As one can presume, SEC-A has a higher consumption rate across all the variety of drinks when compared to SEC-C/D/E segment. SEC C/D/E have lower levels of consumption of beverages which could be because of the cost factor associated with these beverages. The next figure presents the frequency of beverage consumption in terms of percentage of people who consume a drink at least once a week: Evidently, traditional drinks like tea, coffee and milk are the most frequently consumed beverages among Lucknowites. 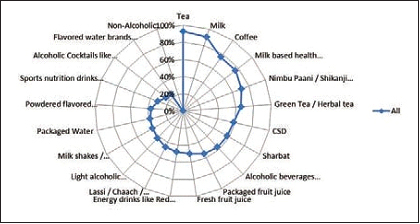 But, interestingly, there is higher frequency of consumption of drinks like nimbu paani and green tea. Green tea occupying an important position is an indication of increasing health consciousness among Lucknowites. In terms of what beverage is consumed at what point of day, as usual tea, coffee and carbonated drinks dominate. The consumption of various drinks across a typical is represented below in a beverage daily clock: The next analysis explores the changing habits of Lucknowites in their beverage consumption over the years. The figure below highlights the categories where major changes have taken place, whether positive or negative. Packaged fruit juices, nimbu paani, and fresh fruit juices are more frequently consumed these days. The trend is to move towards a better and healthier lifestyle. Hence carbonated soft drinks are consumed less often these days. Traditional drinks like lassi/buttermilk, etc. have lost their sheen to fancier drinks like coffee and tea.